Privately owned Hainan Airlines intends to be the first Chinese carrier to enter the Beijing-Chicago market with launch of services in Apr-2013 with the Boeing 787 Dreamliner. It will be Hainan’s second route in the US, after Beijing-Seattle, and third in North America with the carrier also serving Beijing-Toronto. While both American Airlines and United Airlines serve the Beijing-Chicago market, American Airlines is disadvantaged as it has unideal slots at constrained Beijing, which limits connections. As a result, its performance has lagged that of United and its own performance between Chicago and Shanghai, where it has more practical slots. American has partially compensated by carrying more cargo, from which Hainan also stands to benefit. American and United each currently have daily 777-200 service, although United has in the past also used 747-400s. Hainan’s entry will see approximately 860 one-way weekly seats added to the market, with the exact count to depend on the carrier’s final configuration of its 787, which it has so far indicated will be 215. Hainan requested permission from the US Department of Transportation (DoT) to also fly the route with similarly-sized aircraft. Hainan uses Airbus A330-200s on Beijing-Seattle. The carrier expects to operate four weekly services on Beijing-Chicago through Mar-2014, but this could be accelerated. Hainan increased Beijing-Seattle from four weekly to daily in Jun-2012, four years after the route’s 2008 launch, but China-US traffic flows are increasing and Chicago is a larger market than Seattle. Hainan also now has American Airlines as a partner. Hainan expects to make a modest operation profit of RMB6 million (USD952,000) in its first year of operation, assuming four weekly flights. Hainan has improved its performance on the Seattle route, recording an average 65% passenger load factor in 2009, 78% in 2010 and 81% in 2011, according to data from the US DoT. No Chinese carrier has passenger services to Chicago, the third largest metropolitan area in the US. Air China serves Los Angeles, New York JFK and San Francisco in the 48 contiguous states while China Eastern serves Los Angeles and New York JFK and China Southern serves Los Angeles. These carriers, the so-called “Big 3”, are all state-owned and the Chinese government generally tries to limit direct competition amongst all carriers. The lack of a Chinese carrier in Chicago allowed Hainan to receive in Jun-2011 permission from Beijing to operate the route as early as Sep-2011. Not all of Hainan’s previous route requests have been approved by Beijing. China Eastern and China Southern have likely stayed out of Chicago due to the lack of a partner (both are in SkyTeam, which has a weak presence in Chicago) while Air China may have wanted to avoid competition with United, with whom it has a closer relationship than American and Hainan do. The route exemplifies the increasingly complex world of partnerships airlines find themselves in as American Airlines and Hainan Airlines are partners and codeshare on each other’s trans-Pacific and domestic services, giving American access to the Chinese market and Hainan the US market. (American previously partnered with China Eastern before the latter joined the SkyTeam alliance.) United works with fellow Star Alliance carrier Air China. American’s oneworld membership does not have a mainland member, much to the consternation of some carriers in the alliance. In another market pairing without anti-trust immunity, American may see a partner’s entry as negative given greater competition. But given American’s disadvantage in Beijing, Hainan’s entry may help boost American’s service. American commenced Chicago-Beijing services in 2010, by which time Beijing had become severely slot-constrained, with only late night and early morning slots available. United in comparison started its service earlier and was able to attain favourable afternoon slots, facilitating connections. 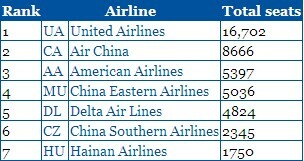 United, based on its current schedule, typically arrives in Beijing at 14:40 and departs at 16:10. American’s schedule sees it arrive in Beijing between 21:30 and 23:30 and then depart between 06:55 and 09:50, although five of its daily services depart before 08:00, eliminating opportunities for inward connections from elsewhere in China. Dometic connections on the outbound sector are also virtually impossible because the Chinese Government does not allow carriers to operate red-eye flights in the domestic market. Hainan, however, is in a far more favorable position given its already large access to slots at Beijing. Hainan has the fourth largest amount of movements, and thus current active slots, at Beijing. Hainan’s entry into Beijing-Chicago may provide scale to American if it does codeshare on the service. American already has blanket approval from the US to codeshare on any Hainan services between the US and China. Depending on Hainan’s flights times, American could potentially offer morning and afternoon or evening flights, increasing opportunities compared to United’s single daily offering. The initially low number of seats Hainan will offer, combined with the fact it is likely to market more to the Chinese market than the US market, should see little lasting pressure on yields aside from typical launch fares. The lack of convenient slots at Beijing is outside of American Airlines’ control, but it has affected the carrier’s performance on the Beijing-Chicago route. 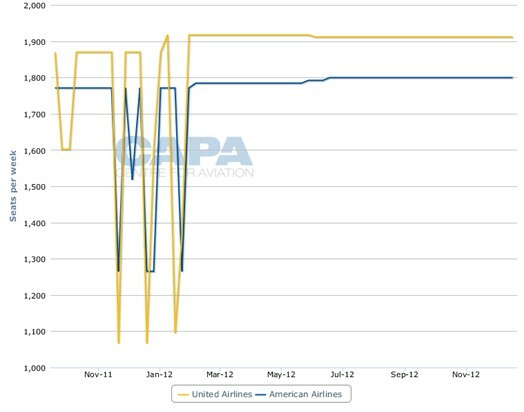 In American’s first 20 months on the route, it has had a lower load factor than United Airlines in all but one month when it recorded a load factor less than 1ppt higher. 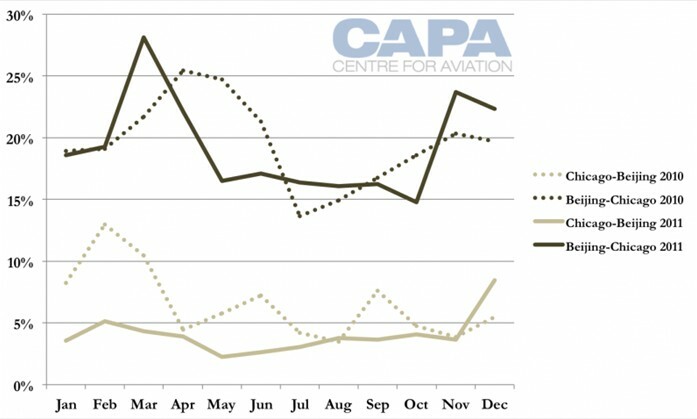 Its average load factor in 2011 was 73% compared to 87% at United. 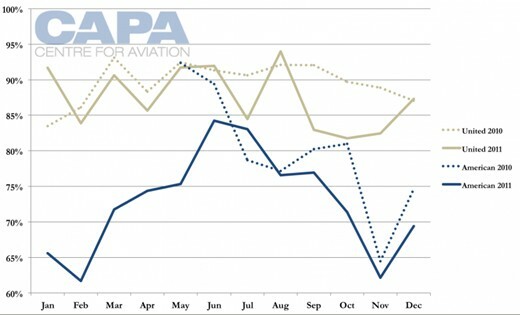 Only load factor information through Dec-2011 is available while there is no yield information. American’s load factors were initially as high as they were at the start of services in May-2010 because American had sold the service with "placeholder" afternoon arrival and departure slots at Beijing, believing it would be able to attain those slots. Instead American received late night and early morning slots, and as this situation became evident – and public – load factors dipped. 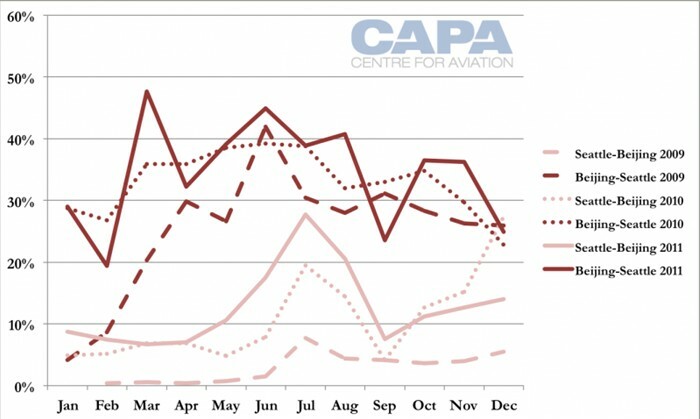 In a rare occurrence, American’s Beijing-Chicago load factor has, through the end of 2011, yet to surpass the first two months of operations. 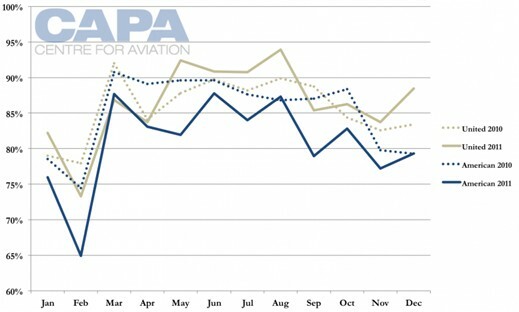 Typically launch months see the lowest load factors. American’s situation is much better on the Shanghai-Chicago route. 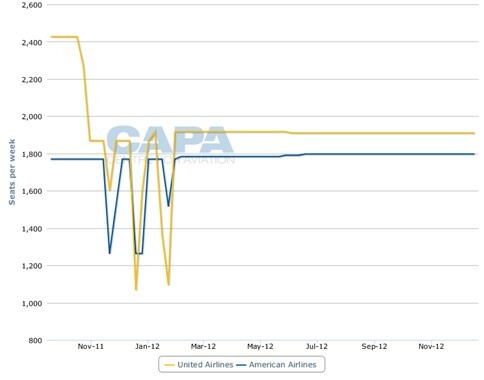 In 2011 it recorded an 81% average load factor while United reported an 87% load factor. American has conveniently-timed slots at Shanghai, arriving at 14:05 and departing at 16:10. United arrives in Shanghai at 13:55 and departs at 15:55. Although the lack of convenient Beijing slots has evidently lowered passenger loads, the reduced weight from fewer passengers has enabled American to place greater emphasis on freight. While United carried 32% more cargo than American in 2010, in 2011 American carried 52% more cargo than United, according to US DoT weight data (cargo yield data is not supplied). But the greater uplift for American was in cargo from Chicago, carrying 167% more cargo than United but only 28% more from Beijing to Chicago. United, and especially American, saw decreased cargo uplift in 2011 compared to 2010, in line with the industry’s general cargo downturn amid slower production in China. Cargo has been very important for Hainan Airlines’ Seattle route and the carrier should expect high uplift on its Chicago service. Hainan has increased Seattle-Beijing cargo (as percentage of total payload) from 3% in 2009 to 11% in 2010 and 13% in 2011. 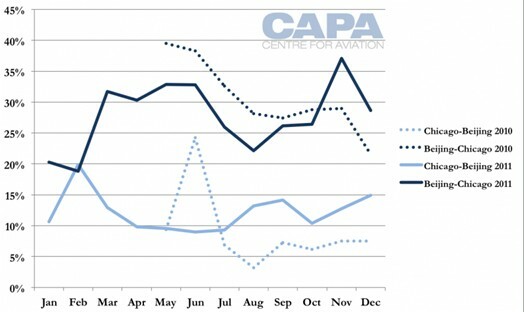 Beijing-Seattle cargo (as a percentage of total payload) has increased from 25% in 2009 to 38% in 2010 and 34% in 2011. The 777-200 according to Boeing has 5330 cubic feet of cargo volume, more than the 787-8’s 4400 cubic feet, although the 787-8 also carries few passengers, reducing space for passenger luggage. The A330-200, which Hainan deploys on Beijing-Seattle, has the equivalent of 4803 cubic feet, according to Airbus. The congestion at Beijing Airport is frustrating to a number of carriers, especially now that new services can typically only receive slots between midnight and the early morning. AirAsia X, Jetstar and Malaysia Airlines are some of the carriers that have recently started new services to Beijing in the midnight hours. Those carriers, however, are able to rely on stronger demand of Beijing as a destination than transfer point owing to their more regional focus. They also serve numerous other points in China, allowing different entry and exit points in China. But the lack of ideally timed slots has been a major frustration of American Airlines. The carrier cancelled its first planned Chicago-Beijing launch in Apr-2010 mere hours before the flight was due to depart. Beijing had initially given American a 02:20 arrival slot and 04:20 departure slot, but American believed it could secure more favorable slots and so scheduled its service with "placeholder" slots entailing a 13:55 Beijing arrival and 16:55 departure, according to local reports at the time. The original Beijing slots would have entailed departing Chicago at midnight and arriving back at 04:00. American had been negotiating with authorities up until 05:00 on the day of the planned inaugural. The midnight hours slots "are inconsistent with local market demand and would complicate flight connections for passengers in Beijing and Chicago," a spokesman said at the time. American said it expected to receive "preferential treatment" as a new entrant carrier in line with "established International Air Transport Association and industry guidelines and procedures". But as the situation at other airlines has shown, Beijing’s congestion issue is not negotiable, at least until a new airport opens later this decade. The service was postponed again on 04-May-2010 before finally launching on 25-May-2010 when American received evening landing slots and morning departure slots. Hainan’s planned Beijing-Chicago service is a small but important step in balancing services between the US and China, where Chinese carriers currently account for only 40% of available seats. This disparity has led the Chinese Government to take a protectionist approach to bilateral agreements, limiting capacity to allow its carriers – relatively young and still developing – to have a better footing in the market. Capacity to China from the US remains relatively low and fares high. 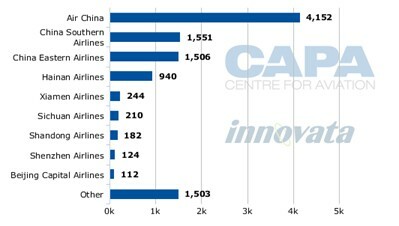 More Chinese services – expected with additional 787 deliveries, and possibly China Southern’s new Airbus A380 – will in turn lead to greater access for US carriers as they seek to link the world’s two largest economies and unlock the large traffic potential between them.